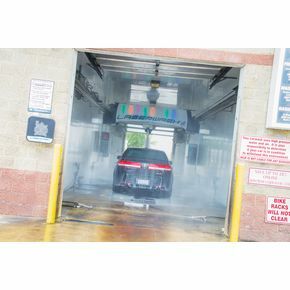 Montrose Laserwash owner Kurt Loos offers one of the most advanced car wash systems available in the state of Ohio. You don’t have to worry about the brushes reaching the back of your car. At Montrose Laserwash, there aren’t any. Kurt's advanced Laserwash 360 System uses sensors﻿ to automatically detect the shape and size of your vehicle for an accurate cleaning that uses less water and less chemicals﻿ than any other system available in the area. The system's revolutionary arch rotates around the entire exterior of any sized car—perfectly, all while maintaining a precise, 14-inch distance from its surface.﻿﻿ Dirt is powered off every square inch of the front, back, and underside of your vehicle. Even if you have a black car, you don’t have to worry about swirl marks and scratches. The sensors on the arm adjust to wash, wax, and rinse cars big and small. Don't trust just anyone with your car's exterior. ﻿ Montrose Laserwash is the safest, gentlest way to clean your car. Get a spotless clean in about four minutes. Montrose Laserwash is located at 58 Brookmont Road, in Akron (Montrose). Visit the website at MontroseLaserwash.com. Montrose Laserwash is open 24/7/365. Purchase a $50 voucher for $25.